Any reviewer takes on a task that they must first define for themselves – known (I think) as a harsh critic I’m also an avid reader. I like ‘failed’ novels as much as ‘successful’ ones and often define the two very differently to the mainstream. So in approaching Harraga by Boualem Sansal I will begin by dividing the intent of the work and the execution and taking about both. The intent of Boualem Sansal is clear – a man whose work is banned in his native Algeria and who was dismissed as a civil servant for criticising the government there is always worth reading. His willingness to continue to protest, to continue to write, to be a critic who risks what all crisis of authoritarian regimes makes his work valuable even if, as I’m going to contend, it is shaky in several aspects. A harraga is a path burner – a beautiful and complex North African word that combines ‘risk taker’ and ‘scorcher of earth’ but means something much less attractive to most of Europe than the translation suggests. Harragas are illegal migrants to the West. As such, this novel sets out to be a chronicle of the disappeared and those left behind, the gaps left by the departed and how those remaining patch the gaps to make life work. It’s a bold idea. Where it’s weakly constructed, for me, is in its narrator, Lamia. The name alone is interesting – the mythological Lamia was a queen who became a child-eating monster. In this novel Lamia, aged 35 and a doctor, is sent a pregnant teenaged girl by her harraga brother Sofiane. This girl, Cherifa, invades Lamia’s solitary and eccentric life, makes friends with her neighbours, creates havoc by wearing Western clothes and then, after an argument – of which there appear to be many – disappears again. The rest of the book is Lamia’s quest for Cherifa, which is allied to her quest for news of the missing Sofiane. I don’t usually go and read other reviews, but this time I did. Because I can’t help wondering if Sansal’s Lamia isn’t a much more complex character than other reviewers seem to think. Maybe I’m reading too much into it, but Lamia’s parents are both dead, her brother Yacine died in a car crash, her beloved friend Louiza (whom she calls sister throughout the novel) dies after marriage, her only remaining brother, Sofiane, runs away and becomes harraga, her neighbours shun her and a desperate teenage girl can only take a couple of months of her presence before running off again. Hmmm … perhaps child-consuming Lamia might have some kind of role to play in her family’s destruction alongside Algeria’s own fundamentalism, extremism and political authoritarianism? But so far I am the only person who seems to consider this a possibility. What is certain is that Lamia pisses nearly everybody off. At the hospital she upsets her colleagues, at the Centre she attends to try and find facts about Sofiane she harangues the staff, she shuns her neighbours and criticises their doorstep gossiping and even calls the man in the old house across the street Bluebeard, until Cherifa pals up with him and finds out he’s a harmless old chap. Her monologues on the nature of the Algerian state and its inability to face the reality of the disappearing generation are searing but she’s difficult to like because her criticism extends to every person she comes across and that makes it problematic to understand where her views are justified and where she’s just intolerant. As she says, ‘Nothing moves the bureaucrats in this country. They would happily send each other to the gallows if it were a matter of sharing out three lean cutlets. Insipid and underpaid, they drift toward crime as naturally as soap suds flow towards a drain.’ Beautifully expressed fury – but Lamia’s own actions are not dissimilar; despite knowing that Cherifa is alone, very young and has quite poor judgement, Lamia manages to be so irritated and to manage her own household so inadequately that Cherifa leaves again, more pregnant, more alone and even less well-equipped to deal with the world outside Lamia’s ancient front door. Those to whom Lamia speaks most often are the ghosts inside the front door – the former owners of her house who counsel her about her life and her relationship with Cherifa. These monologues too are one-sided; we only know what Lamia tells us of these encounters. In the end that’s the key weakness of the book – we experience everything through Lamia and she’s either unreliable or one-dimensional. The end of the book has a certain triteness too, which I can’t make too clear as it would be a spoiler, but the proposed solution to fulfil a woman whose life is as empty and catastrophic as Lamia’s is almost pathetic in its inadequacy. Either that, or it’s fiendishly convoluted and contains a darker reality about what living with repression creates in those who fight it as much as those who surrender to it. 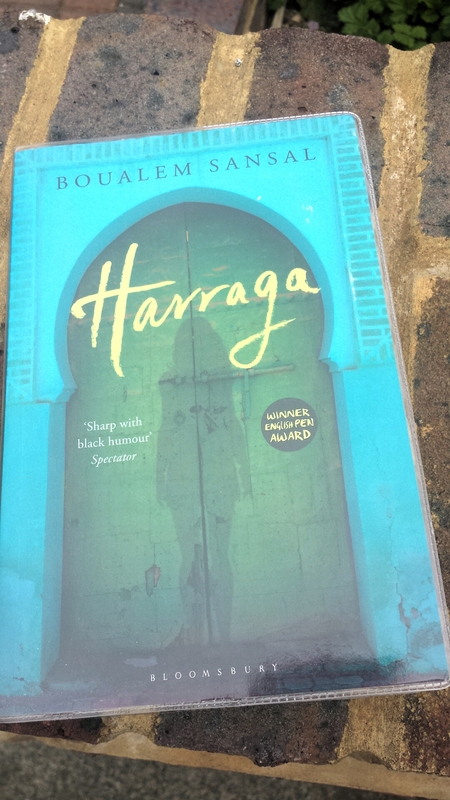 For me, the novel’s conclusion led to a moment where I wondered if Sansal wasn’t telling us that a state like Algeria must devour all its young to continue to exist, but again – I seem to be the only reviewer who’s seeing that. Make of it what you will, the detail of this book is worth the read, the daily life of Algeria at the turn of the century is bitterly indicted and while Lamia herself is fragmented and often irritating the novel attempts something important – an insight into the nature of life lived under extremes and what it can do to all those involved.